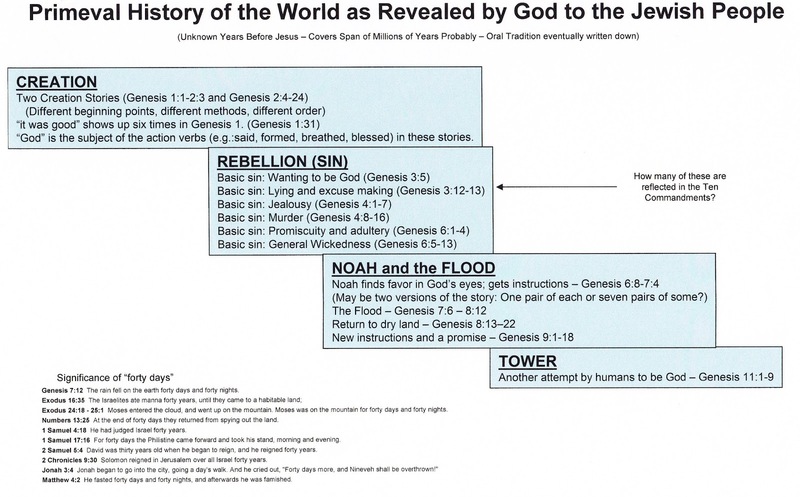 Here is a brief and possibly helpful outline of the four major Biblical events in primeval or ancient or prehistorical times covered in the first eleven chapters of Genesis. Whether these stories are taken as literal truth as some fundamentalist Christians do or as revelation of eternal truths told and eventually written in the genre of myth, the focus must be on what they teach about God and humankind. 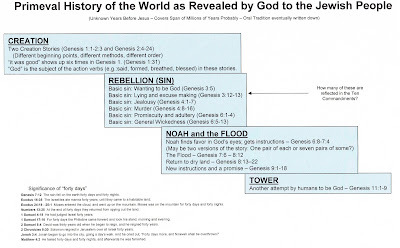 An interesting feature is the first mention of "forty days" as a significant period of time.That is how long the flooding rain lasted in Genesis, it is how long Jesus was tempted in the wilderness, and the tradition survives in the Church today in the forty days of Lent. Some other examples are listed on the exhibit below. There is an interesting summary of Biblical uses and significance of that time period at American Catholic website.